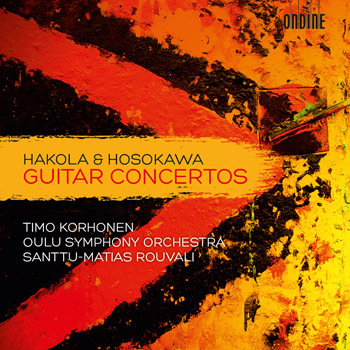 Ondine proudly presents world première recordings of two Guitar Concertos: one by Kimmo Hakola and the other by Toshio Hosokawa. These are performed by Timo Korhonen - the guitarist for whom the concertos were written - and the Oulu Symphony Orchestra conducted by Santtu-Matias Rouvali. Kimmo Hakola's Guitar Concerto is a colourful exploration of themes connected to both medieval and modern Southern Spain and Northern Africa. Toshio Hosokawa takes a more meditative approach as he searches for symbolic universal harmony in his music. Timo Korhonen is one of the world's most acclaimed guitarists. He has premiered over 40 new works during his career, and has made several critically acclaimed and award-winning recordings. Santtu-Matias Rouvali has recently made a number of significant international debuts. He participated in the Dudamel Fellowship Programme in 2011/12, and will start his tenure as Chief Conductor and Artistic Director of the Tampere Philharmonic Orchestra in September 2013. He is also the Principal Guest Conductor of the Copenhagen Philharmonic Orchestra. This CD is his debut disc. The Oulu Symphony Orchestra has developed considerably over the last few years under Anna-Maria Helsing. Johannes Gustavsson will continue this development from this autumn when he takes over as Chief Conductor.